Adversarial training (also called GAN for Generative Adversarial Networks), and the variations that are now being proposed, is the most interesting idea in the last 10 years in ML, in my opinion. 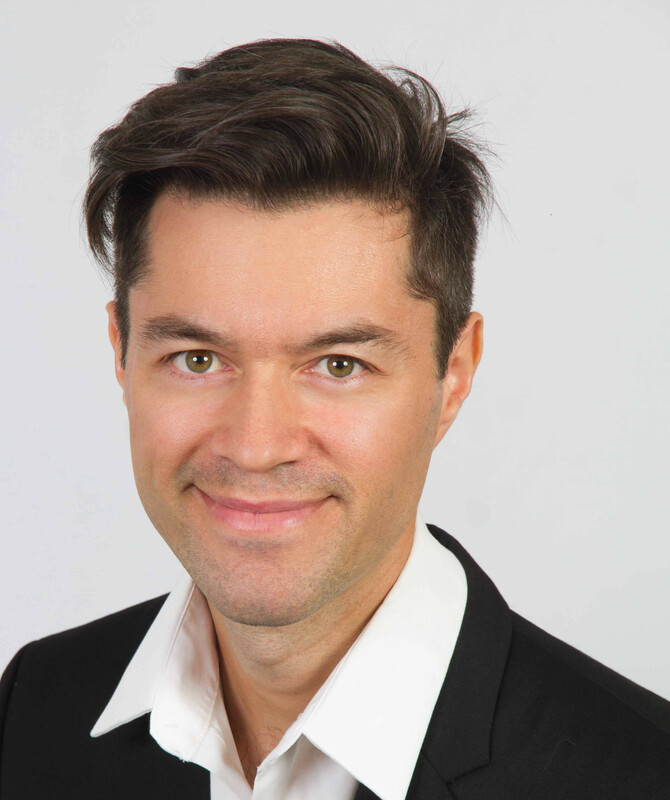 You heard it from the Deep Learning guru: Generative Adversarial Networks  are a very hot topic in Machine Learning. In this post I will explore various ways of using a GAN to create previously unseen images. I provide source code in Tensorflow and a modified version of DIGITS that you are free to use if you wish to try it out yourself. Figure 1 gives a preview of what you will learn to do in this series of posts. Part 1 will give you an understanding of GANs and part 2 applies GAN models to generating celebrity face images. Figure 1: from left to right: original image (OI); OI + “young” attribute; OI – “blond hair” + “black hair”; OI – “smile”; OI + “male” + “bald”; animation showing interpolations across the images. What is a Generative Model? In machine learning, a generative model learns to generate samples that have a high probability of being real samples like the samples from the training dataset. Let’s take an example to understand what this means: consider a world composed of all possible 64×64 8-bit RGB images. There are 23x8x64x64 possible arrangements of the pixel values in those images. This is a staggering number, much greater than the number of particles in the universe. Now consider the set of images that represent faces of people. Even though there are many, they represent a tiny fraction of all the images in the world. Learning a probability distribution of the set of face images means that the model needs to learn to assign a high probability (of being a real sample) to the images that represent a face and a low probability to other images. Finally, consider a dataset of a few thousand face images: learning to generate new samples from this dataset means that the model needs to learn the distribution from which the images in the dataset were drawn. Ultimately the model should be able to assign the right probability to any image—even those that are not in the dataset. A generative face model should be able to generate images from the full set of face images. a Discriminator D that receives samples from both G and the dataset. G and D have competing goals (hence the term “adversarial” in Generative Adversarial Networks): D must learn to distinguish between its two sources while G must learn to make D believe that the samples it generates are from the dataset. A commonly used analogy for GANs is that of a forger (G) that must learn to manufacture counterfeit goods and an expert (D) trying to identify them as such. But in this case—and this is a very important GAN feature— forgers have insider information into the police department: they have ways to know when and why their products are marked as fake (though they never get to see any of the real goods). Likewise, the police have access to a “higher authority” that lets them know whether their guesses are correct. During training G and D keep playing this game, getting better as they play, until they both become so good that the samples produced by G are indistinguishable from the real stuff. Let me illustrate with an example: suppose I train a GAN on a dataset of luxury handbags. The following dialogue would be a plausible play. The Expert stands in a room in front of the Higher Authority. The Forger is lurking in the background and can hear anything The Expert says, though he cannot see any of the action. The Higher Authority picks a luxury handbag from a drawer and presents it to The Expert. The low, resonating voice of the Higher Authority echoes through the room. Higher Authority: Is this a luxury handbag? Expert: Hmmm, I can’t say I’ve ever seen a luxury handbag before. This looks fine enough but I know for a fact that The Forger would be trying to deceive me so I say it’s a fake. Higher Authority: Wrong! That is a fine luxury handbag. The Higher Authority now requests a sample from The Forger, who produces a carrot. The carrot is presented to The Expert. The Higher Authority picks another luxury handbag from a drawer and presents it to The Expert. Higher Authority: OK, is this a luxury handbag? Expert: Why, you’ve got to be kidding! That’s the same fake you showed me before! You can’t put anything in it. It’s definitely a fake! Expert: Apparently you can shove stuff in it, like the other handbags so I say it’s a luxury handbag! Higher Authority: Ha! Wrong again! Expert: I have no idea. I don’t want to commit. 50/50? Higher Authority: This is a 100% luxury handbag! Expert: This doesn’t have handles! It’s a fake! [The Higher Authority, feeling generous, gives The Forger another chance. The Forger runs to the nearest store and hastily comes back with a plastic bag]. Expert: Mmm, it’s got handles and you can put stuff in it. Is this real? The Expert: OK I get it. The luxury bags had leathery bits. And a shiny logo. I’ll be more careful next time! I can feel I’m getting good at this! I will spare you further details of this fascinating story but in the end the forger learns to produce the most sophisticated designer handbags that even a cohort of experts would not be able to identify as fakes (better than random guessing). One important aspect to keep in mind here is the fact that since D is trained continuously, G cannot simply go about generating the same samples over and over. In particular, if D has ample capacity, it may be able to memorize all the samples that G ever produced and become expert at spotting fakes. How would G then be able to continuously handcraft novel samples? Going back to our dataset of face images, assuming your are G and already in possession of a few realistic images (or at least deemed as such by D), one reasonable way of coming up with an increasing number of realistic images would be to apply small perturbations to the images that you already have: crops, rotations, color transformations, etc. This way you could create a virtually infinite number of new images, but chances are D would start noticing patterns there and punish you. In order to alleviate this issue, G learns to generate very different samples: given a set of random numbers, which is called the latent representation, or in short the z vector, and through a number of neural layers, G learns to generate new samples that depend on z sufficiently strongly that a different z will yield a very different sample. It may be hard to believe at first, but through training, every factor in z, or combination thereof, specializes toward one characteristic feature of the dataset. For example, in a dataset of face images, factors might represent the gender of the person, the color of their skin, their pose, etc. D receives an image from the dataset and is optimized to classify it as “real”. In practice, this means that its parameters are updated through gradient descent in a direction that moves it closer to classifying the image as real (probability one). A random z is drawn from which G generates a new sample. D receives the sample and is optimized to classify it as “fake” (probability zero). G is optimized to make D classify the sample as “real” . Figure 2: Illustration of the GAN framework: D (Discriminator) is alternately presented with images from G (Generator) and from the dataset. D is asked to distinguish between the two sources. The problem is formulated as a minimax game: D is trying to minimize the number of errors it makes. G is trying to maximize the number of errors D makes on generated samples. The curvy arrows represent the back propagation of gradients into the target set of parameters. Why Are GANs So Popular? If intelligence was a cake, unsupervised learning would be the cake, supervised learning would be the icing on the cake, and reinforcement learning would be the cherry on the cake. We know how to make the icing and the cherry, but we don’t know how to make the cake. – Yann LeCun, 2016. Another reason for their popularity is that GANs are considered to generate the most realistic images among generative models . This is subjective, but it is an opinion shared by most practitioners. Besides, the learned latent representation in a GAN is often very expressive: arithmetic operations in the latent space, that is to say the space of the z vectors, translate into corresponding operations in feature space. For example, you can see in Figure 1 that if you take the representation of a blond woman in latent space, subtract the “blond hair” vector and add back the “black hair” vector, you end up with a picture of a woman with black hair in feature space. That is truly amazing. 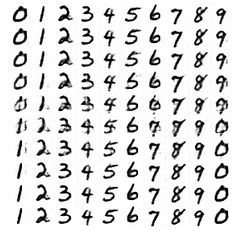 Figure 3: Sample images from the MNIST dataset. 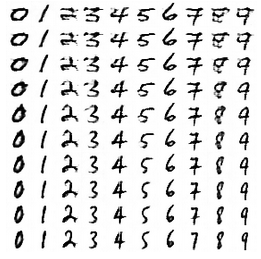 An introduction to any deep learning topic would be incomplete without an application to the MNIST  dataset, a popular dataset featuring images of handwritten digits (Figure 3). Note that labels aren’t required to train a GAN, but if I do have labels (as is the case for MNIST) I can use them to train a conditional GAN. A conditional GAN is one that is conditioned to generate and discriminate samples based on a set of arbitrarily chosen attributes. 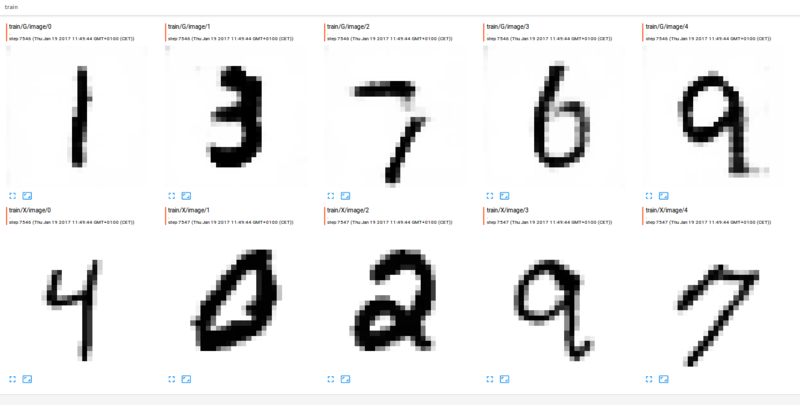 On MNIST, I can condition the GAN on the class of the number I would like to generate. In practice, I concatenate a one-hot representation of the class to the activations of every layer. For fully-connected layers the one-hot representation is just a vector of length 10 (because we have 10 classes of digits) with zeros everywhere except when the index matches the class ID. This idea can be extended to convolutional layers too: in this case conditioning is materialized by a set of 10 feature maps with zeros everywhere except for the feature map whose index is the class ID, which is filled with ones. During training, the latent representation z is sampled from a 100-dimensional normal distribution; an arbitrary choice that yields acceptable results. Network conditioning, and the topologies of my G and D networks (a slightly modified version of DCGAN ) are illustrated in Figure 4. Activation functions are not shown in this figure, but importantly the activation function for the last layer in D is a typical sigmoid. Figure 4: Top: the generator (G) network. Bottom: the discriminator (D) network. Layers are traversed from left to right. Network conditioning is illustrated by the black (zeros) and white (ones) feature maps/units. In the above example the third feature map is white, denoting the fact that the corresponding label is assigned to the third class (digit “3”). Implementation based on . Grey feature maps/units mark computed activations. I have based my Tensorflow integration of DCGAN into DIGITS on the excellent implementation from . You can see the flow of data in Figure 5: images from the dataset go through D, and there is an identical copy of D (discriminator_1) which receives images from G.
Figure 5: Tensorboard visualization of the DCGAN graph. One technicality is that in order to create two identical instances of D I need to create the layers twice and let Tensorflow know that I want to reuse variables (weights and biases). This is easily done with a call to scope.reuse_variables() as in the following example code. Another important aspect to keep in mind is the set of parameters passed to the optimizer. By default, Tensorflow optimizers (subclasses of tf.train.Optimizer) compute gradients with respect to all trainable variables in the graph and update them all on every iteration of the optimization loop. That is not what you want in the GAN framework: when you train D to identify generated samples, you really only want to modify the state of D. If you let the optimizer change all variables including those of G then it would be just as easy to make G generate garbage and that would not be a fair play. So when you train D you want to freeze the state of G and vice versa. That might sound obvious but since it took me a while to figure it out, I thought I would mention it. Again, this is easily done in Tensorflow with optional parameters (in bold letters in the following) to the optimizer. D is trained to predict a probability distribution: the probability that a sample $latex x$ belongs to each of the known classes. There are only two classes since a sample is either real or fake. In the original formulation of GAN, D is trained to maximise the probability of guessing the correct label by minimizing the corresponding cross-entropy loss , where is a one-hot encoding of the label, is the predicted probability distribution and is the class index. If represents the probability that is a data sample, then for generated samples. When the GAN framework is formulated as a minimax game, D tries to minimize and G tries to maximise it. That’s rather unfortunate for G because during the early phases of training when the output of G is less than convincing, D easily assigns a very low probability to . 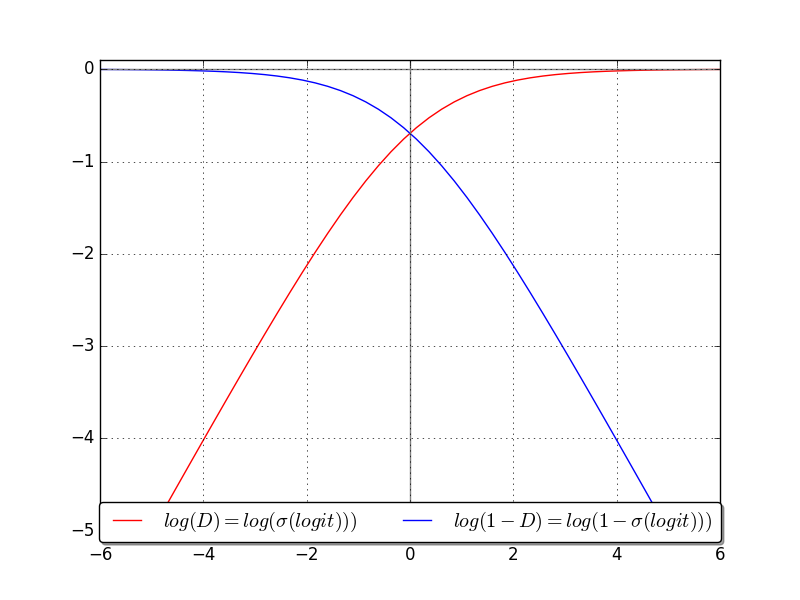 This implies that the number before the last sigmoid activation function in D is a large negative number and, as the blue curve in Figure 6 shows, the loss saturates (it is flat and the gradient is tiny) as highlighted in . This makes G learn very slowly, if at all. Therefore it’s common to reformulate the optimization objective for G as a maximisation of —the red curve—instead, which yields the same solution but exhibits much stronger gradients in the negative quadrant. Another common solution is to flip the labels: make D predict 1 when optimizing for G. One further refinement that I implemented to alleviate the penalty of an overconfident D is to use one-sided label smoothing and replace the hard label of 1 when optimizing D on real samples with a softer 0.9, as suggested in . Figure 6: Illustration of vanishing gradient in the negative quadrant when using the original loss formulation log(1-D) (blue curve). The x-axis is D’s logit (output of last layer before sigmoid activation). Minimising log(1-D) yields the same solution as maximising log(D) (red curve) but the red curve exhibits stronger gradients. 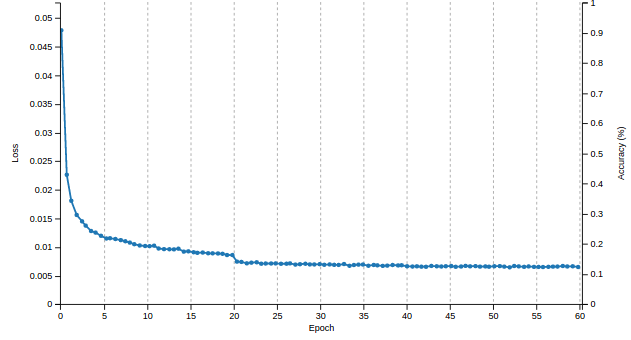 The first thing that I usually check when training a neural network is whether the loss function is going down. However here there are two components of the total loss: D’s loss and G’s loss. By construction, the two losses cannot simultaneously go down. Otherwise D and G wouldn’t be called adversaries! How do you determine whether training is successful? This turns out to be rather difficult in practice, and the subject of ongoing research. For one thing, you can check whether the game is well balanced. How does that translate into meaningful loss values? If G’s loss is very low this means D is unable to recognize fake samples, possibly because it classifies everything as real. Remember that all the knowledge in G comes from D through back-propagation. G is therefore unlikely to generate good samples if D is doing a poor job at spotting fakes. At equilibrium you would expect D to not be able to do better than random guessing, meaning that it would assign probability 50% to all samples. Going back to the definition of the cross-entropy loss, this would yield a loss value of $latex -log(0.5)=69%$. That number should be easy enough to remember. This causes generated images to be added periodically to my Tensorboard log and I can then monitor them in real time as illustrated on Figure 7. Figure 7: Image samples from an arbitrary iteration of the training loop. Tensorboard updates these images in real time during training. Top: output of G. Bottom: samples from the dataset. Figure 8 shows the loss curve in DIGITS. As you can see, all losses are relatively close to 69%, an indication of a well balanced game. Also, the curve (purple) goes down steadily, another reassuring sign. 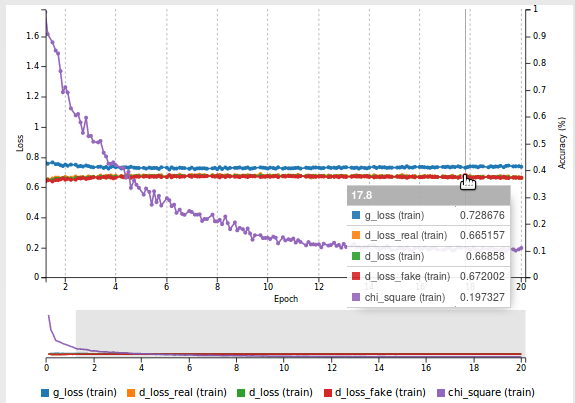 Figure 8: DIGITS visualization of the loss curve when training a GAN on MNIST. I could pick random values of z and generate random images but it would be great if I could more deterministically choose attributes of the images I create. Remember that in my conditional GAN, the latent representation (z) and the class labels are separate. Therefore, I can pick one value of z and generate matching images for all classes. I can also do what I call a class sweep: pick one z and slowly interpolate across classes to get smooth transitions between digits. Have a look at Figure 9 for examples. Each grid uses the same value of z and a different label. Figure 9: Two class sweep grids, using a random z vector for each grid. Figure 10: Animations of the grids shown on Figure 9. You can start to get a feeling of what is going on: style features like stroke width and curvature seem to be encoded in the latent representation. In other words, each grid seems to use a different style of handwriting. You can also see on the animations on Figure 10 that transitions between digits are very smooth, an indication that the latent space yields a continuous space of real-looking images. Now I can also do what I call a style sweep: pick two random values of z and interpolate between the two corresponding styles, for each class. See Figure 11. Figure 11: Style sweep. Two random values of z were picked and images from top to bottom are interpolated between the two styles. Each column represents a different class. Now you might wonder how to do the interpolations in practice. Intuitively I would use a linear combination of my z vectors to perform interpolation in latent space. However intuition rarely works in a high-dimensional space. Tom White  points out that linear interpolation (taking the shortest path between points) leads to intermediate points that have very improbable norm and are therefore unlikely to be visited during training. That means the model may not perform well on these points. This led White to advocate the use of spherical interpolation: interpolating between two points as if walking on the surface of a high-dimensional sphere. See Figure 12 for an illustration of the difference between linear and spherical interpolation in 2D space. Spherical interpolation has become the standard way of performing interpolation in GANs. I used spherical interpolation for all examples in this post. 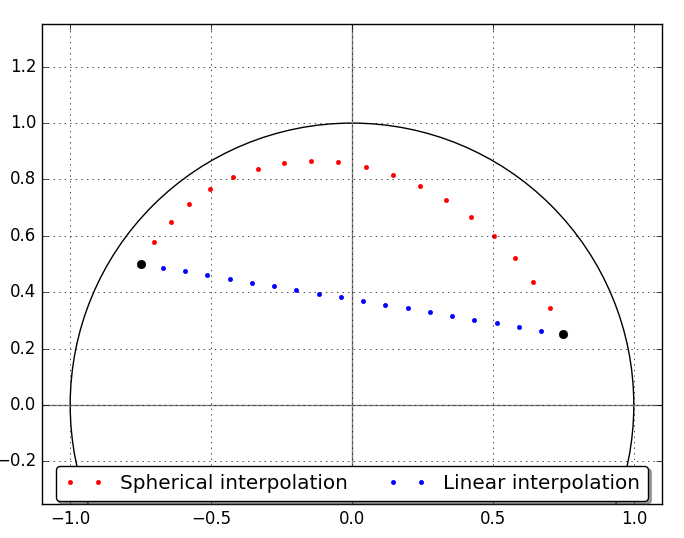 Figure 12: Illustration of the difference between spherical and linear interpolation between two points (black dots) in 2D space. I can keep sampling random z vectors until I find a style that I like. But is there a more direct approach? What if I have an image of a digit in my dataset that I really like and I would like to generate all other digits using the same style? One limitation in the standard formulation of a GAN is that there is no mapping from feature space to latent space. In other words, given a sample, there is no direct way to find the corresponding z vector. Several papers were published to address this issue, most notably  and . Without getting into the details of the proposed solutions, they all modify the original GAN framework and provide no guarantee that the model will converge to the same solution. Feeling uneasy about this I decided to implement my own solution: I wanted to separately train an encoder, that is to say a network that outputs a z vector when given an image as input. To verify that the z vector is correct I feed it to G and then check whether the generated image is similar to the input image. One question that arises is: how do I design a network that can extract features from my images that are useful enough to produce a good z vector? Well, I already have such a network: D! I just changed the number of output neurons in the last layer of D to 100 (the length of z), plugged the output of my modified D (let’s call it E) into G and used the L2 distance between the output of G and the input image as a loss. I have essentially reversed the order of things in my GAN and created a GAN Auto-encoder. This is utterly simple but works well enough in practice. 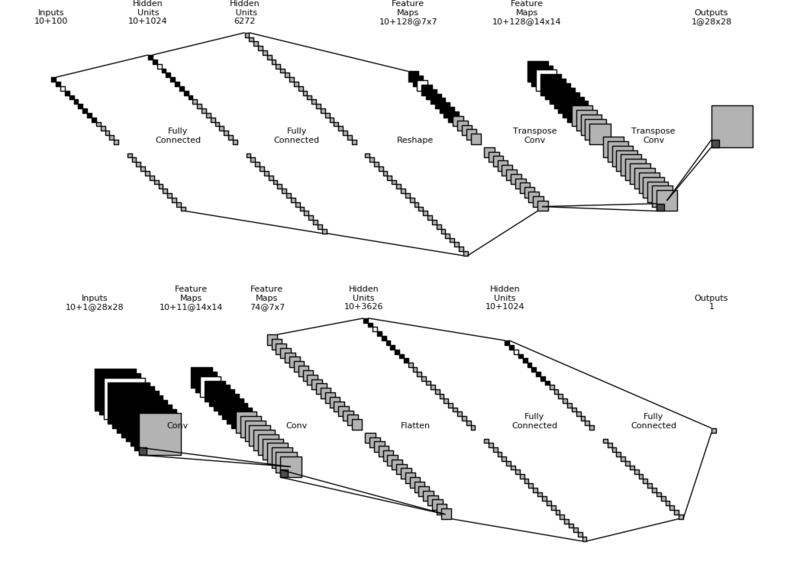 See Figure 13 for an illustration of the encoder topology and Figure 14 for an illustration of the new set-up. Figure 13: Encoder (E) network topology. E is the same as D with more output neurons in the final layer. Figure 14: Encoder framework: the modified D is now an encoder E with 100 output neurons that plugs into G.
Importantly, in order to train E it is critical to initialize its weights from the weights of a trained D. In deep learning jargon, this is known as transfer learning. When I train this model in DIGITS, the learning curve is incredibly smooth, as you can see in Figure 15. I could use a more subtle similarity metric (L2 is a little bit gross here) but I found it that this simple scheme works well enough in practice. Armed with my encoder I can take an image from my dataset and find the corresponding z vector (Figure 16). Note how the reconstructed number resembles the input image. Figure 16: Visualization of the encoder inference. Left: input image. Middle: reconstruction. Right: z vector. I was then able to generate a grid of digits (Figure 17). Note how all digits in the grid seem to be written in the style of my input image. Figure 17: Class sweep using the z vector generated by E in Figure 16. Stay tuned for the second part of this post where I will show you how to use Generative Adversarial Networks to generate images of celebrity faces. Visit the NVIDIA booth at ICLR Apr 24-26 in Toulon, France to see a demo based on my code of a DCGAN network trained on the CelebA celebrity faces dataset. As you’ll see in Part 2 of this series, this demo illustrates how DIGITS together with TensorFlow can be used to generate complex deep neural network architectures. Follow us at @NVIDIAAI on Twitter for updates on our ground breaking research published at ICLR.